Project obstacles and solutions: Early in the morning of Friday, April 19,2013, the Lafayette area experienced nearly 2.5 inches of rain. The heavy rain caused a manhole and sanitary force main line to collapse and erode a portion of the substructure under Highway 26 at Creasy Lane. The void under the road was a danger to traffic and the broken sewer line posed a danger to public health. The City of Lafayette called Bowen Engineering to assess the damage and work quickly to fix the problem. This intersection is one of the busiest for traffic in and out of Purdue University and this was the weekend of the Purdue Grand Prix, the annual go-kart fundraiser that attracts large crowds to the campus. Bowen crews quickly went to work. They began digging out the old pipeline on Friday afternoon. Crews worked throughout the night and had the line repaired by Saturday night. The IMI Lafayette East concrete plant and drivers were called into action late Saturday to provide imix Flexifill to backfill the trench and provide support for the new sewer line. IMI trucks began delivering 96 yards of imix Flexifill at 8:00 p.m. Crews then worked to repair the road so traffic could travel on it on Sunday morning. IMI delivered 28 yards of concrete for the street. 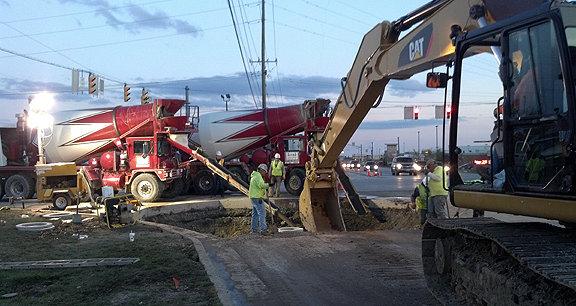 The IMI QC/QA team designed a quick-setting concrete mix that would gain early strength and support traffic the next morning. The last batch of concrete was delivered at 11:00 p.m. on Saturday night. On Sunday morning, traffic was allowed back on the newly repaired section of Highway 26. For more information on imix Flexifill and other fill products from IMI, click here.